Divers searched 'every nook and cranny" of the sunken wreckage for any sign of David Ibbotson. Speed limits in St Helier and Grouville will change on Friday in an effort to "increase road safety and ensure greater speed consistency along roads", the Government of Jersey said. New 20mph zones will be introduced inside the St Helier ring road, in the Grouville parts of Gorey Village, and the roads to the south and east of Grouville School. A 30mph speed limit will be introduced along the east coast road from the existing 20mph speed limit at Ville és Renaud through to the existing 30mph speed limit at the parish boundary with St Clement. A list of the roads affected and maps showing the speed limit zones can be found here. Police are appealing for information after two men in their early 20s got into a fight with a shopkeeper in St Helier. It happened in Colomberie Precinct on Friday 22 February at about 17:35, Jersey Police said. The shopkeeper, aged 40, sustained injuries that were treated at the time but did not require a hospital stay. A 21-year-old man was arrested for conduct likely to cause breach of the peace and a 22-year-old was arrested on suspicion of grave and criminal assault. They have both since been released. Police would like to speak to anyone who may have been in the area at the time. Witnesses can call officers on 612 612. All Condor Ferries passengers will need to carry photographic identification (ID) from Friday 1 March - as the company introduces compulsory ID on inter-island sailings and to Poole and Portsmouth. The change is a "desire to adopt best practice and fall into line with international standards", the company added. Acceptable forms include a valid or recently expired passport, driving licence or national identity card. Children under the age of 16 can travel without photo ID. A swimmer was rescued off St Brelade's Bay after getting into difficulty in the water, Jersey Fire and Rescue Service has said. Its inshore rescue boat - along with the RNLI inshore lifeboat - launched at about 11:40. The woman was seen struggling in the water about 100m south of the wayside slipway. She was treated at the shoreline by members of the public before being transported to hospital suffering from the effects of hypothermia. The RNLI has reminded people to never swim alone and to always swim parallel to the shore and not straight out. Parking at Le Port in St Peter has been restricted to 12 hours in order to deter vehicles from being left overnight or longer. In addition to the time limit on parking, there will be changes to the layout of the car park so longer vehicles can't access the narrower areas. Although camping or sleeping in a vehicle parked on public land is illegal, it has been informally tolerated by the parish authorities. However, in recent years the popularity of camping in the area has grown to the point where the activities of some campers are causing problems for the honorary police at night, the Government of Jersey said. Freeview viewers in parts of the Channel Islands may need to retune their TV equipment next month to continue watching some programmes. Some Freeview channels are moving to new airwaves to allow for the future development of new mobile broadband services, the service said. Transmitters are being updated region by region as part of a major engineering programme being carried out between now and 2020. The required changes will begin in the early hours of 13 March and Freeview services will be subject to disruption during the day until late afternoon. About 30,000 homes are served by the affected transmitters. The BBC understands divers are currently searching for the body of pilot David Ibbotson. 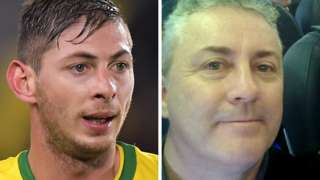 Last month, a private search for the missing plane he piloted located the wreckage and the body of passenger and Premier League footballer Emiliano Sala. Shipwreck hunter David Mearns led that search team, and previously tweeted he was assisting with attempts to find Mr Ibbotson, which would be "technically very different" to the previous underwater search. In a notice issued to mariners, Guernsey Harbours has asked vessels to give the dive boat Skin Deep a "wide berth" between 06:00 and 12:00 on Wednesday. The dive vessel is currently situated near where the Piper Malibu Mr Ibbotson piloted lost contact with air traffic control. After months of disputes over pay, teachers and police officers in Jersey have been offered a new deal. The States Employment Board (SEB) has authorised the formal pay offers and unions have agreed to consult their members on the offers. The offer is for the rate of inflation plus 1.3%. Inflation is currently at 3.9% but ministers are looking at ways to bring that down. Until now, the SEB has always maintained there was no more money available for extra pay. The offers for 2018 and 2019 have not changed. These pay offers for 2020 demonstrate the government genuinely values our employees, and that we have listened to their concerns. We wish to ameliorate the impacts of pay constraint and the rising cost of living in recent years. The pay increases proposed are significant and compare well with similar roles in the private sector or in the UK public sector. St Brelade Bay in Jersey has been voted one of Britain's best beaches. It was ranked third in the Travellers Choice Beaches Awards, which are based on the quality and quantity of reviews and ratings over a year on TripAdvisor. Bournemouth Beach in Dorset topped the list, and Luskentyre on the Isle of Harris in Scotland came second. Devon and Cornwall also made it into the top 10, with Woolacombe in Devon in fourth place and Perranporth in Cornwall ranked ninth. 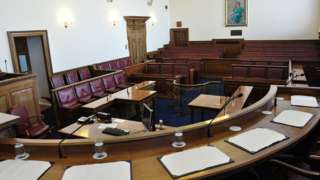 In what could be a February first, politicians in Guernsey's parliament have been told by the presiding officer they can remove their jackets. Sir Richard Collas told politicians: "Having shivered and frozen last month we're now in danger of overheating, so those who wish to do so may remove their jackets." On Monday, Guernsey saw its highest February temperature in 71 years, at 15.6C (60F). 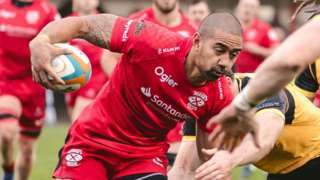 Jersey Reds agree new contracts with centre Apakuki Ma'afu, back-row Jake Upfield and prop Zei Alexis until May 2020. 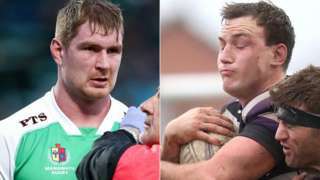 Second rows Alex Thompson and Liam Hallam-Eames will join Championship side Jersey Reds next season. 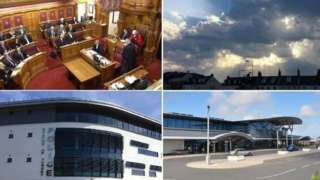 Winds of force six can be expected across the islands later, Jersey Met has said. It has issued a yellow weather warning for wind. 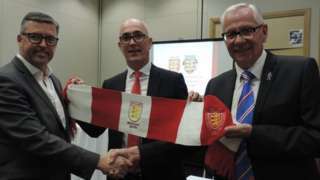 Jersey Football Combination has merged with the island's FA after more than 40 years of independence. The government in Guernsey has said there are plenty of retail jobs available in the island for those who need them. The statement by the States Employment and Social Security Department follows the closure of three retail shops this month - Beghins, Miss Selfridge and HMV. A number of other retailers and businesses have also closed their doors in St Peter Port over the last few months, but Deputy Michelle Le Clerc says people shouldn't delay asking the committee for help as the job centre will help support them to find work. Jersey Premiership side St Peter have been knocked out of the Kent Senior Trophy after losing their semi-final 3-2 at Beckenham Town. Calvin Weir had given the islanders an eighth-minute lead, but Luis Medina equalised 24 minutes into the first half. Beckenham took a second-half lead before Ruben Pestana made it 2-2, however the home side were able to get a winner.